VERY UNIQUE PROPERTY! This is a bulk property sale which involves 4 property ID's. This amazing opportunity is located less than 1/2 mile from the new Baldwin Bypass Project which is now underway. 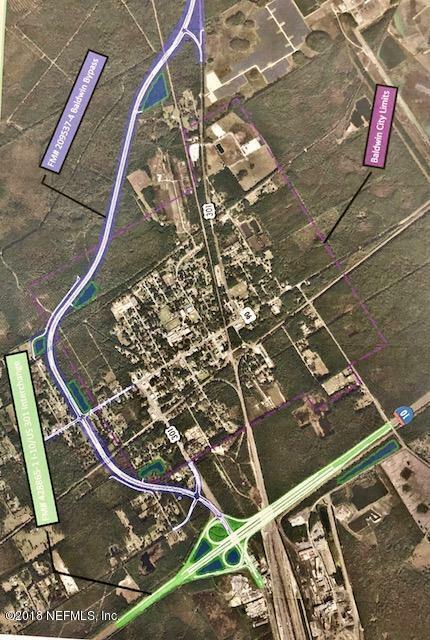 This Bypass will provide a new connection to the I-10/US 301 Interchange and a new road alignment that will bypass ongoing congestion within the town of Baldwin, which is located at the Duval/Jacksonville west property line. From the I-10/US 301 Interchange, the bypass will head north on a new alignment west of Baldwin tying back into US 301 where it has been widened to four lanes. (near Hap Road) What an opportunity rather it be commercial/industrial/residential development/etc. This is becoming a clean slate for a multitude of opportunities. Industrial warehouses, truck terminals,and so many more opportunities. Regardless of the "need".......this location is fabulous. This 30 +/- acres sits of the north side of US90 with more than 970 feet of US90 road frontage. The depth of the property is more than 1300 feet. This property sits LESS THAN 1/2 MILE from the new Bypass, only 3/4 of a mile from the current US301 and LESS THAN 1.5 miles from the I-10/US 301 Interchange. This Interchange project is reconstructing ramps, adding new ramps and new bridge structures over US301 AND CSX Railroad! This entire 30 +/- acreage involves a trust owned property (24.26 acres) and 3 additional home sites located on approx. 1.5 acre lots. Two homes are brick homes and two are off grade homes all belonging to one family of siblings. All property owners/siblings are working together to make this one bulk sale opportunity. Negotiations will be much simpler as a bulk sale opportunity. The property is being listed across the board at a $66,312.00 per acre price.This property is currently zoned residential, but because of the Baldwin Bypass road, things are certainly changing. Great opportunity, especially for warehouse/industrial opportunities involving semi trucks. A perfect spot for easy Highway/Interstate access.